The Trump administration is reviewing ways to clamp down on the export of U.S. technology that China’s government could use in its surveillance and internment of minority Muslims, amid reports of mass detentions of ethnic Uighurs and others in the Xinjiang region. U.S. Commerce Secretary Wilbur Ross delivers a speech during the Americas Business Summit in Lima, Peru, April 12, 2018. 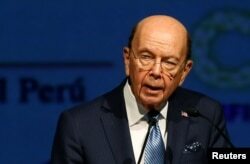 “We are conducting this review expeditiously and expect to publish amendments to the EAR (Export Administration Regulations) later this fall," Ross said in the letter to Senator Marco Rubio and Representative Chris Smith. Any sanctions decision would be a rare move on human rights grounds by President Donald Trump's administration against China, with which it is engaged in a trade war while also seeking Beijing's help to resolve a standoff over North Korea's nuclear weapons. Indian Muslims shout slogans during a protest against the Chinese government, in Mumbai, India, Sept. 14, 2018. 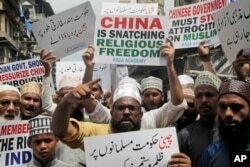 Nearly 150 Indian Muslims held a street protest demanding that China stop detaining thousands of Uighur Muslims. Ross' letter was a response to that letter. The State Department expressed deep concern last month over China's "worsening crackdown" in the Xinjiang region, as officials considered sanctions against Chinese senior officials and companies linked to allegations of human rights abuses.